Last weekend Miss M, her Auntie and I had a fabulous girly morning at the Finders Keepers markets. It was the first time they've come to Adelaide and I was in awe of the aisles upon aisles of all the pretty things. My main aim though was to catch up with Emma from Happy Hands Happy Heart to sample her beautiful, squishy, scented, natural play doughs (hand made with 100% love). In all honesty, if it wasn't for Emma's play dough play area, Miss M would have been a bit bored with the whole outing, but we could not get her away from the play dough tables. Of course we had to go back for a second visit before we left. Image credit Finders Keepers Instagram - used with permission. Every letter starts with rolling a long snake! 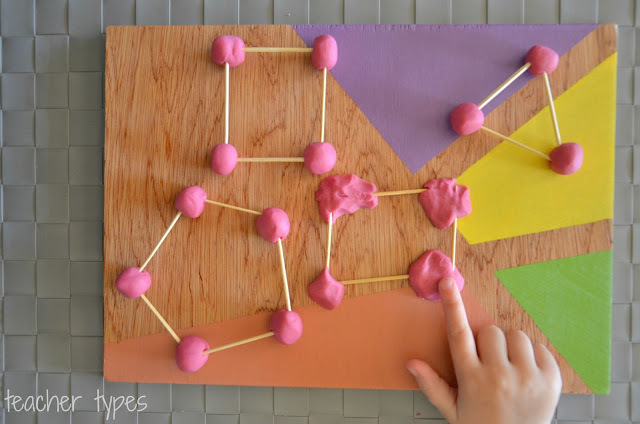 Easy peasy, and lots of kids do this with play dough instinctually. To help them make the letters, write them on some paper for them to 'trace' with the play dough on top, or use as a guide to copy underneath. 5-6 year olds should be able to just make the letters themselves. Image credit Happy Hands Happy Heart Instagram - used with permission. A beautiful thing I love about Emma's Instagram gallery is her quotes and words imprinted in her play dough. This same idea can be applied for children to learn their name, sight words or spelling words. Way before children learn how to write numerals, they need to have a concrete understanding of what 'number' is. What does 4 look like? What does 7 look like? Roll little balls of play dough and practise counting them - remember 1:1 correspondence is important, meaning for each ball they touch, they say one number. Add a die to this activity for an extension or even start exploring concepts of addition. Standard play dough naturally encourages the sense of touch (obviously) - but the Happy Hands Happy Heart play dough is beautifully scented (we got to try pink grapefruit and lavender) which is also going to invoke the senses of smell and sight. What a great starting point for a unit of work in Science about the five senses. 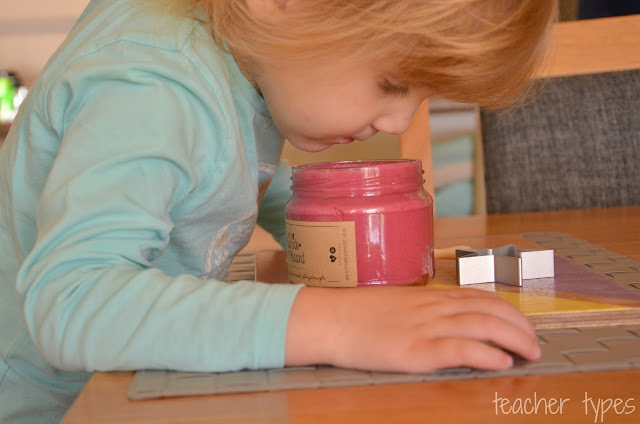 Kate from Picklebums has some brilliant play dough mats to encourage little artists to create pictures and sculptures with playdough. 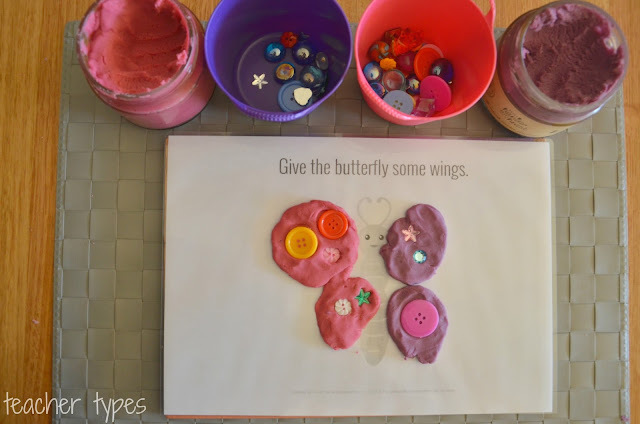 We made a butterfly with our Happy Hands Happy Heart play dough and some loose parts (please note; these actually do come in beautiful colours - we just don't have a colour printer!!). 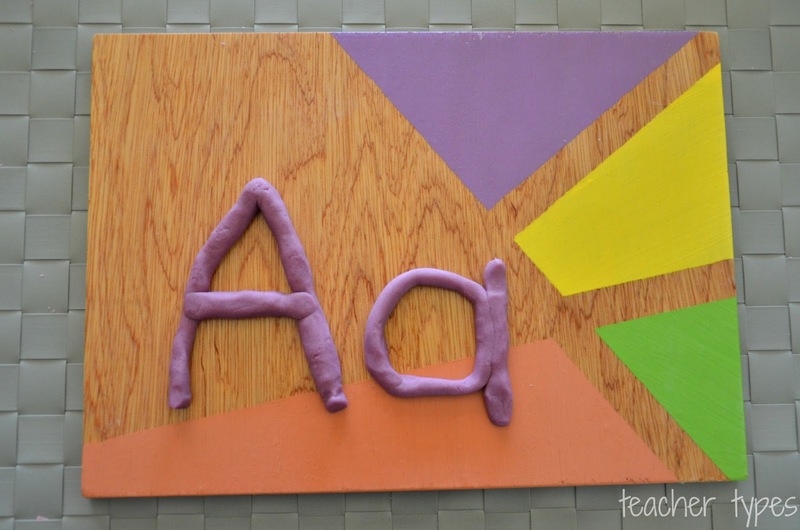 Take their art work to another level by finding interesting objects to create imprints and patterns in the play dough. Cookie cutters are a simple way to create 2D shapes with play dough, and again it's what children will naturally do. A simple addition of matchsticks or pop sticks can transform 2D shapes into 3D creations. In order for children to fully comprehend what a 3D shape is, they need to touch, hold and see it in 3D form. They're more likely to remember it's features if they have made it themselves. 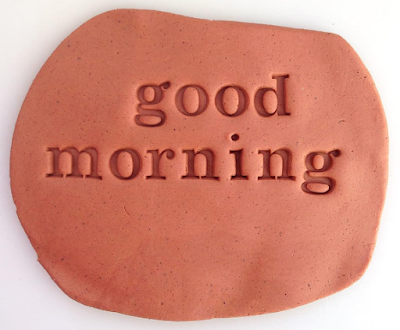 Play dough has a wonderful unique calming quality which some children may benefit from throughout their school day when they are feeling overwhelmed, anxious, upset or just need some chill out time to prevent to meltdown before it starts. A calm down station which may include play dough, glitter bottles, books, headphones etc might be an excellent addition to your classroom for special needs students. Can you imagine a whole class of 30 kids all playing with play dough at once!! It would be mayhem and I guarantee that about half of it would end up smushed into the carpet. In my classroom, I would always set up a play dough table for small groups of children to work with it at one time. Use your SSOs to take a small group to another area, try it in your literacy rotations, or put it out in the morning to keep early arrivals quiet and busy. Wet weather indoor play time? Another great small group opportunity. Set out an invitation to play with carefully chosen coloured play dough perfectly paired with materials to tie in with your theme. Living things? Green + brown play dough with cut up green straws, fake flowers, button flowers and bug toys. Ocean? Blue play dough + yellow for sand, fish toys, shells, pebbles etc. Farm, Dinosaurs, oh there are so many more possibilities! I'm sure that every Junior Primary teacher ever does Friday afternoon free activity. Tell me it's not just me! (Lol) Bring out the play dough every week or just keep it for a special treat. Add it to your home corner to encourage more imaginative play as it's cooked and dished up for a tea party. Or use it to reinforce skills learnt over the week (letters, numbers, words, shapes etc as above). I'm so honoured to share Emma's beautiful play dough with you today (kindly gifted for the purpose of this review). There are some really special biz mums out there and she is one of them. 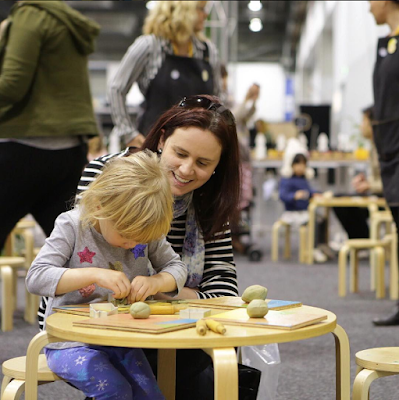 A mum of three from Bendigo, her children are the official play dough testers. How lucky that when they're asked "What does your mummy do?" they can say "She makes play dough!". We love our HHHH play dough. It smells delicious and is so soft. Oh how we love play dough.. LOVE it! And that Mama-made play dough looks so lovely and squishy and soft!! So many great ideas here, some I know but had forgotten about.